Hearing aids are small electronic devices that you select with the help of your hearing professional. They are worn in or behind your ear. They amplify sound so that a person with hearing loss can listen, communicate, and participate more fully in daily activities. Hearing aids can help people hear better in both quiet and noisy situations. However, only about one out of five people who truly need help from a hearing aid actually use one. A hearing aid has three basic parts: the microphone, amplifier and receiver (speaker). The hearing aid receives sound through the microphone, which converts the sound waves to electrical signals and sends them to the amplifier. The amplifier increases the power of the signals and then sends them to the ear through the receiver, assisting the hearing impairment. 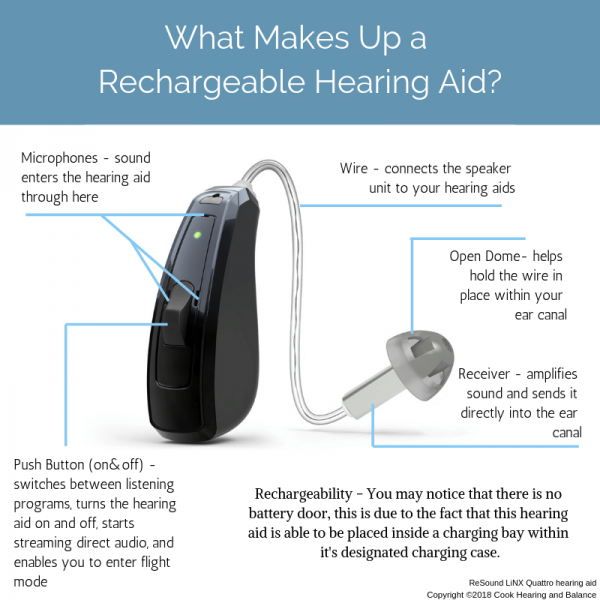 Hearing aids are primarily helpful for improving the hearing and speech comprehension of people who have hearing loss that results from damage to the small sensory cells in the inner ear, called hair cells. This type of impairment is known as sensorineural hearing loss. The damage can occur as a result of disease, aging, injury from noise, or certain medicines. Hearing aids magnify sound vibrations entering the ear. Surviving hair cells detect the larger vibrations and convert them into neural signals that are passed along to the brain. The greater the damage to a person’s hair cells, the more severe the hearing loss, and the greater the hearing aid amplification needed to make up the difference. However, there are practical limits to the amount of amplification a hearing aid can provide. In addition, if the inner ear is too damaged, large vibrations will not be converted into neural signals. In this situation, a hearing aid wouldn’t be helpful. Now that you’ve learned a bit about hearing aids, let’s talk about the different hearing aid styles!